Gov. 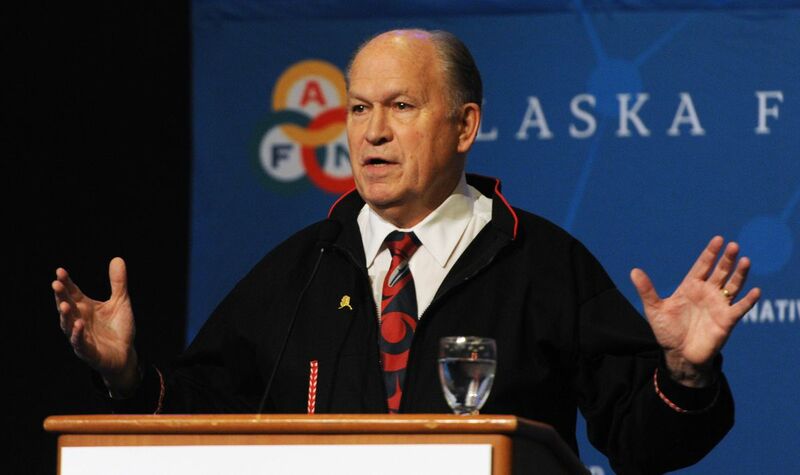 Bill Walker on Thursday apologized to Alaska Natives for historical wrongs that once threatened their culture, during what he acknowledged might a be swan song speech before the Alaska Federation of Natives annual convention. Walker is facing a tough re-election bid complicated on Tuesday when running mate Byron Mallott, then the lieutenant governor, resigned after making unspecified inappropriate comments to a woman. "You know, this may be the last time I address you formally, I recognize that," the governor told the convention. Walker said he'd spent a lot of time reflecting on doing the right thing. "That's when I decided to do what I'm about to do," Walker said with surprise force. "I conclude today with this message, as the 11th governor of the State of Alaska, I apologize to you, Alaska's first people, for the wrongs that you have endured for generations," he said. "For being forced into boarding schools, I apologize." "For (being) forced to abandon your Native language and adopt a foreign one, I apologize." "For erasing your history, I apologize." "For the generational and historic trauma you have suffered, I apologize." "This apology is long overdue," he said. "It is but one step of hundreds more to go on this journey toward truth, reconciliation and healing." Walker thanked the audience in Tlingit, Mallott's Native language, saying gunalcheesh three times. The qaspeqs worn by Alaska Natives are uniquely beautiful — hooded, flowery blouses with patterns often reminiscent of berry-filled tundra. But one qaspeq outside the AFN convention hall was particularly powerful. 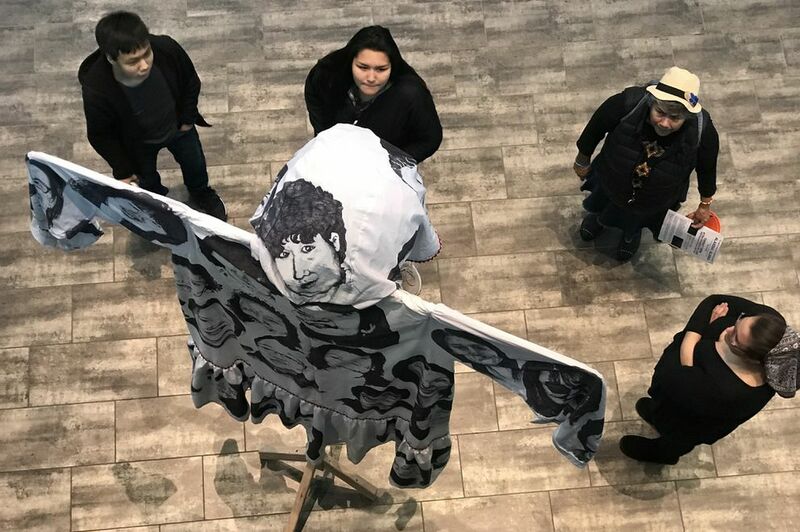 Big enough for a giant to wear, displayed on a wooden frame with its arms outstretched, the qaspeq's pattern was not flowers, but faces of missing and murdered Alaska Native women. The 47 life-sized faces, in black-and-white, seemed hauntingly real, as if the people were alive today. Amber Webb, a Yup'ik woman, created the qaspeq and stood before it Thursday, as onlookers bombarded her with questions and praise. "These are people that have been taken from us," she said. "This is to physically represent the grief our communities have." Barbara Franks, chair of the Statewide Suicide Prevention Council, stood before the display in awe. Remembering these people is important to help the living heal from the trauma that occurs when people go missing or loved ones are killed, Franks said. "This brings a voice to all the women on there, that their death is not in vain," Franks said. Seeking to strengthen ties with the military, Alaska Native leaders held a naming ceremony for U.S. Air Force Gen. Terrence John O'Shaughnessy on Thursday. The head of the U.S. Northern Command and North American Aerospace Defense Command now has four Native names, from different regions of the state. That's apparently one for each of O'Shaughnessy's four stars. The new names includes Agyarrlak in Yup'ik. Pronounced aagh-ya-thak, it means "North Star." That's perfect for someone who helps protect Alaska, since the North Star gives guidance and direction, said Ana Hoffman, AFN co-chair from the Yup'ik region in Southwest Alaska, during the ceremony. Sen. Dan Sullivan, a full colonel in the U.S. Marine Corps Reserves, was part of the ceremony. He said stronger ties with the military could bring more improvements to health care for rural veterans, and contracting opportunities for Alaska Native corporations as the military boosts its presence in Alaska. The military has also helped the Southwest Alaska community of Newtok, relocating to a new village on higher ground as climate change erodes its coast. "The sky's the limit in this partnership," Sullivan said. O'Shaughnessy, whose commands are located at Peterson Air Force Base in Colorado Springs, Colo., said there could be new contracting opportunities with Native entities in areas such as fuel and energy that need to be provided, and logistical support. Some of that is already happening, he said. "This is a different environment than most of the world and understanding those challenges and how to operate efficiently" is knowledge Alaska Natives share with the military, he said. Alaska Native leaders presented the general with gifts, including a traditional chief's shell necklace from the Athabascan region, presented by Will Mayo, another AFN co-chair. The Cup'ik name Cayailkun, meaning "shield or protection." The Tlingit name Aan Kade'ili, meaning "protector of the land." The Inupiat name Qusitbuqduaq Siilatii, meaning "great leader." A grunting, huffing, humming performance by two Inuit throat singers from Ottowa turned heads during the convention. Charlotte Qamaniq and Cynthia Pitsiulak, nose-to-nose with microphones in hand, at times sounded as varied as an entire band. But their music seemed to spring from the land, like large animals mating, small animals fighting, or women giving birth. There was a catchy melody to the songs. Some of the noises were unbelievable, like there was a Tasmanian devil in their throats. Mayo said he couldn't stop humming along after they'd left the stage.